I’ve just started with V-Ray after years of using mental ray. I’m trying to be methodical but there is a lot to learn… Here are my notes on things that tripped me up and the new features I need for VFX. For compositing we need the background to be black while the forground elements include reflections and Gi from the sky. In Mental Ray this is done with a Ray Switch Map but in V-Ray we can use the Invisible option in the VRay Light. When the Dome Light is Visible the texture also appears in the Alpha channel of the Render. Setting the Invisible option also sets the background alpha to black. Use ‘save all Image channels’ to or save as an .exr file get deep pixel info out of the V-Ray Frame Buffer window. Show the frame buffer History dialog by clicking the little H button at the bottom. V-Ray does not support Max’s mechanism for supersampling materials and maps. 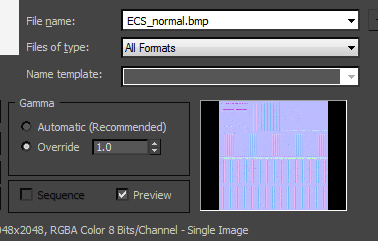 Instead, texture antialiasing is controlled by the image samplers. By default V-Ray antialiases everything in the image, including textures. Getting elements out of 3dsMax needs some experimentation. V-Ray Adv works with everything But while V-Ray RT does support elements in version 3.0 many seem broken. 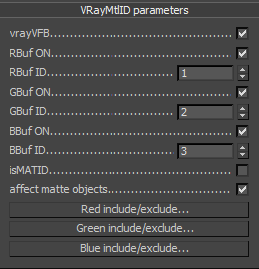 There are two different dialogs for saving V-Ray passes. V-Ray has many different Render elements. There are various possible setups depending on the complexity of the scene and the detail need in the composite. Work in a linear colour space, or the maths goes wrong and the lighting is way to dark. Ideally use 16 or 32bit float .exr files for rendered images. VRayRawGlobalIllumination and VRayRawLighting elements must be multiplied by the VRayDiffuseFilter element before they are added to the final image. The VRayRawShadow is unusual. It can be added to the VRayRawLighting to adjust the shadow intensity. Simply adding the two elements produces lighting as though no shadows were computed. 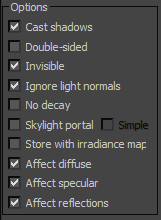 VRayOptionRE is a special render element that controls settings for V-Ray that are otherwise unaccessible. It does not create an actual image but does control several important exr settings. This element creates an RGB image. Each colour channel is a mask based on a material ID or Object ID. This powerful element has a bunch of options for different utility passes including. Note: Normally I’ll set up simple: Red,Green,and Blue self illuminating materials to do masking rather than ID elements. Because it’s easy, and I get nicer antialiasing. It’s worth noting that the V-Ray ZDepth pass is correctly calculated as the distance of each pixel from the lens nodal centre. Often in CG (especially games ) the zdepth is crudely calculated as the perpendicular distance of the pixel from the camera plane. This means that in the corners pixels have z values that are too close to the camera. In the viewport the V-Ray camera clipping plane is flat . Because its not curved when we use it as reference for the Z depth pass we need to push it slightly further back. This will make sure the Z depth element does not go out of range. Network rendering works pretty simply through Backburner. Just remember to set the server address in the V-ray License server Information of your render slave. Add the IP or computer name of your server here. Tuning vray to improve render times is a bit of a dark art. In principle the are various rules of thumb that can be learnt to balance the various settings this prevents computation time being wasted on details that wont be seen. There are some good tutorials online. If you’re just starting then I recommend doing the following tutorials in order. Akin Bilgic has a beginners tutorial here for optimizing VRay settings by hand.